Click here to learn more about the Mercury Switch Out Program. At Dom’s Auto Parts, we are active members of several associations and proud participants in a variety of environmental programs. 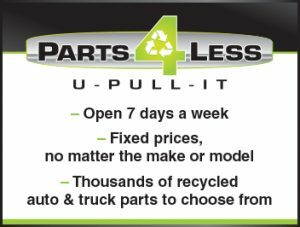 We are also a national and international certified auto recycler. The Ontario Automotive Recyclers Association has been the voice of the auto recycling industry in Ontario since 1992. OARA has kept Auto Recyclers informed and involved with input and information into current industry trends and government legislative initiatives that affect auto recyclers. The Automotive Recyclers of Canada is committed to maintaining the highest standards of environmental stewardship and business ethics among their members. An award-winning national program dedicated to removing, collecting and managing mercury-containing convenience lighting switches and anti-lock braking systems (ABS) sensor modules from end-of-life vehicles. Ontario Tire Stewardship (OTS) operates the Used Tires Program, a province-wide tire recycling program that diverts tires away from burning and landfills to 3 Rs (Reduce, Reuse, Recycle). While our primary mandate is to ensure Ontario’s scrap tires are responsibly managed, we are also driving innovation and fostering the right economic conditions to expand the markets for Ontario tire-derived products. Established in 1994, the CAR program was created to produce a set of standards for general business practices as well as environmental and safety issues and to provide guidance for member facilities in adhering to these standards. This program is one of the cornerstones of our association as the facilities participating strive to put forward quality service and parts for the professional automotive recycling industry. CAREC provides recyclers with the most relevant information and tools to prevent hazardous materials contained in end-of-life vehicles from contaminating our water, land, and air during and after the vehicle recycling process. The Gold Seal Program is a voluntary quality assurance accreditation program for ARC members that essentially guarantees high quality recycled parts, with no surprises on delivery. It utilizes a series of standards, audits and Customer Satisfaction Indexes (CSI) requirements to help ensure the best quality recycled parts are reliably provided to repairers, insurers and the motoring public. Leading to healthier communities and economic prosperity through the protection of Ontario’s air, land and water. Dom’s Auto Parts is a licensed and certified End-Of-Life Vehicle waste disposal site with the Ministry of the Environment and Climate Change.